Ahhh…the lazy days of Venezuelan summer. Perfect for strolling through streets perfumed of sun-ripened mangoes, whistling to the Efe ice cream song on balmy Friday afternoons…and, if you’re Diosdado Cabello, trying your hand at some good old political persecution. With two weeks left before the National Assembly goes on summer recess, MUD politicians busy figuring out last minute candidacies, and the rest of the country heading into a collective, if devaluated, August stupor, the time has come to once again deploy the State apparatus and screw with some legislators while nobody’s watching. See, just like fashion and pop jams, politics in Venezuela has its own summer trends. And if ankle-strapped sandals are the new wedge platforms, and Get Lucky is this year’s Call me Maybe, then impeachments are definitely the new inhabilitación. If you want to be really up on this hot new fad, you need a crash course in Parliamentary Immunity. Members of Parliament (MPs) enjoy this constitutionally mandated guarantee as a means of safeguarding their right to freedom of thought, and ensuring that their legislative deliberations are not conditioned by political pressures or other ways of compromising their autonomy. What the Venezuelan Constitution does not establish is the exact process through which Parliamentary Immunity can be revoked. Art. 200 of the Constitution states that the Supreme Justice Tribunal must impeach the legislator in question, and then request the consent of the National Assembly in order to proceed; it does not specify voting procedure. Art. 187, however, does clearly state that in order to temporarily or permanently separate an MP from office, a two-thirds majority is necessary, much to Chavista MPs’ chagrin. 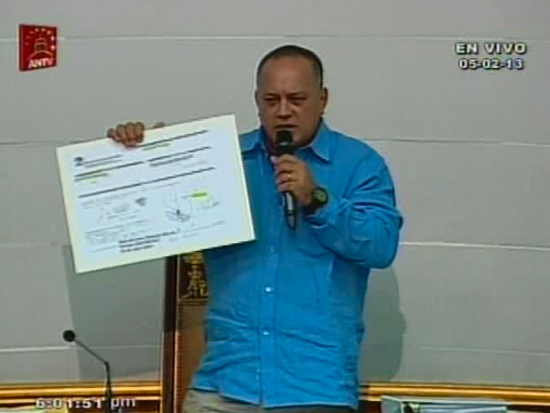 When asked about this procedural issue, AN President Diosdado Cabello replied that it was merely….you guessed it! A formality! He prefaced this statement by admitting he was not a lawyer. Which is true. But you know what, I’m not a mathematician, and I still know that 2/3 does not equal 1/2. So first at bat is Richard Mardo, a representative of Aragua State from Primero Justicia. He is to be stripped of Parliamentary Immunity by a simple majority vote in today’s AN session, and slapped with a disqualification from running for office in the near future. Without going into too many details, and gross violations of due process aside, Mardo is being charged with Money Laundering and Fraud, after several checks and money transfers of dubious authenticity and no illicit origin were presented by Diosdado before the AN, proving Mardo’s alleged crimes in one fell swoop. Mardo has not had access to legal council nor to the State’s investigation into his case. On a completely unrelated note, Mardo is the frontrunner for being elected Mayor of Girardot – Maracay to you and me – Aragua State’s biggest important municipality and a long-time bastion of chavista power. Next up is María Corina Machado, independent MP for Miranda state (and – full disclosure – my political mentor). She has been summoned to appear before the impartially titled “Joint Committee for further investigations of the Anti-Democratic, Anti-Patriotic and Fascist confessions of MP María Corina Machado” tomorrow. She’s being accused of treason following the public broadcast of an illegally obtained and digitally manipulated audio recording of a private conversation she had with her former history professor. PSUV MP Jesús Farías has already made public that the intentions of said committee are to compile evidence in order to revoke Machado’s parliamentary immunity and dismiss her from office. Now, if there are still any doubts left as to the accuracy of my trend report, proof that impeachments are IN and inhabilitaciones are sooo two years ago is the TSJ’s surprise decision to lift David Uzcátegui’s political disqualification on Monday night. And who could argue with this? What hipsters did for skinny jeans, Leopoldo López did for inhabilitaciones: they’re so common now, that they’re no longer fashionable. Impeachment is all the rage. So, to those who see chavismo as retrograde, let me disabuse you: Diosdado is an innovator when it comes to devising fresh new ways of negating electoral outcomes, silencing dissent, assailing the separation of powers and manipulating our justice system to impose his arbitrary will.